Visualizer digs deep into your Contact Center Activity - Call Reporting Software for Avaya, Cisco, Toshiba, Iwatsu Telephone Systems - TASKE Technology Inc.
TASKE Visualizer Unparalleled visibility into your call center. Visualizer is a powerful search tool with an unmatched visual cradle-to-grave representation. Every call can be dissected and tracked within your telephone system. Now you have the ability to respond and improve call center performance as well as your customer experience. How many times was that customer transferred? How long did they wait on hold? Who talked to them, for how long, and when? Who hung up first? Use the call flow visualizer as a training tool to improve call handling techniques. It provides a call display that follows every event in the life cycle of the call, providing a detailed record to respond to complaints. Create filters to search for calls using everyday language. And save those filters for reuse. View the origin and destination of all calls in your call center. Monitor unassigned extensions for inappropriate telephone utilization. Quickly identify toll restriction or call fraud problems. 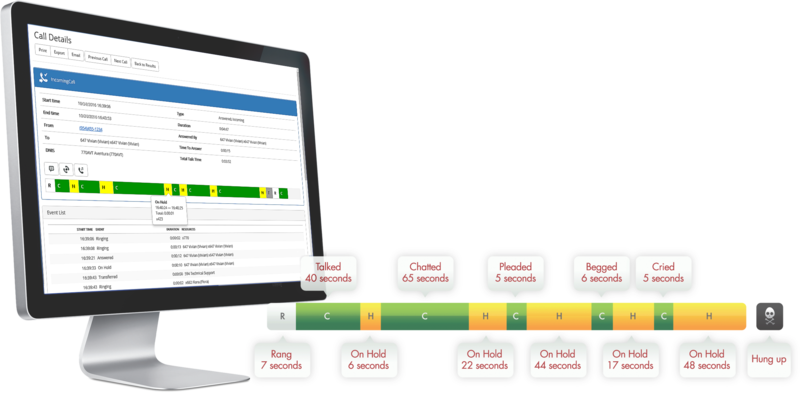 Cradle-to-grave view of every call, available as a drill down for live calls from our real-time views. Access your customer interaction data anywhere, anytime, via a web-based interface. View call details from multiple sites all through one interface. "Visualizer is why we love TASKE!" The detailed call analysis has been invaluable for resolving disputes, particularly over call wait times. Directors can better manage caller expectations when dealing with issues as they are prepared with information from Visualizer, such as the phone number from which the call was placed, the queue that received the call, the agent that answered the call, any hold time during the call, and so on.